1. 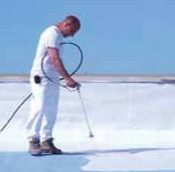 Prepare roof surface per specification. 2. Apply SPF with a minimum thickness of one inch. 3. Coat foam surface with appropriate Conklin coating system. Conklin’s highly-reflective roof systems have been providing quality solutions to the roofing market since 1977. A great return on investment is another important reason to install Conklin’s SPF Roofing System. Many satisfied building owners discover that a Conklin roof pays for itself during the warranty period in lower air conditioning costs. Federal tax rebates, tax credits and deductions may also offset your investment. Check with your local utility company, tax advisor, and www.energystar.gov for additional details. Conklin SPF Roofing Systems provide leak-free protection and exceptional energy savings for years, often exceeding the warranty period. They maintain maximum reflectivity and energy savings because their surfaces are resistant to dirt and discoloration. Annual or bi-annual cleaning is all that’s needed to keep them white. Your Conklin Roofing Contractor will inspect your roof and advise you of the best Conklin system for your building. 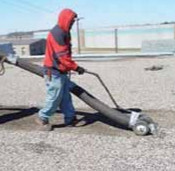 Years from now, when it’s time to renew the superior protection of your Conklin roof, a simple recoat will do the job. In most cases, multiple recoats can be done for the entire life of your roof, saving you the expense of a new roof. With your recoat, our material warranty may also be extended. 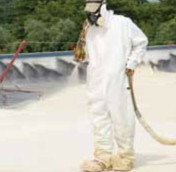 Yellow Jacket Construction and Roofing offers non-prorated warranty on labor and material.